When you limit your idea of exercise to cardio and weight machines, it can get pretty boring pretty quickly. There are other ways to lose weight and actually enjoy your workout, like bouncing on a mini-trampoline. Known as rebounding, no backyard is necessary to try out this hot new trend to get back in shape. Fitness enthusiasts love the Urban Rebounder, according to Exercise Equipment Advisor. Not only does it enhance your balance but it develops better coordination and core muscles too. 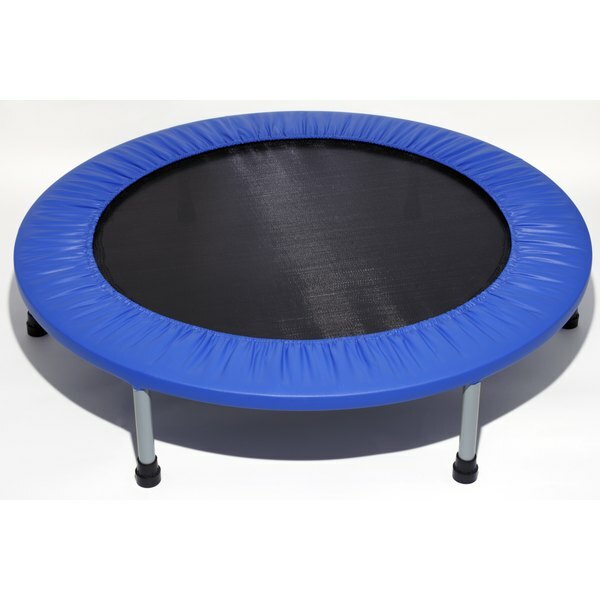 This low-impact, high quality mini trampoline features a stabilizer bar and an instructional workout DVD, and supports up to 300 lbs. Choose to jump indoors or out and, when you're done, fold it up for easy storage and portability. Quoted as "the most efficient and effective exercise yet devised by man" by NASA, rebounding improves circulation, lowers cholesterol, and reduces stress and tension among many other healthy benefits. Rated the best by weightlossresources.co.uk, the Reebok Rebounder is a club-quality mini-trampoline made for all ages and abilities. This washable rebounder features a solid spring system, a stable 6-leg design, and is easy to store. Simply screw off the legs. Recommended by Dr. Morton Walker, D.P.M, a rebounding specialist for over 25 years, the Cellerciser features all steel construction which keeps the rebounder from cracking, and comes with a carrying bag, an instructional DVD, book and booklet plus an exercise chart. Made from weather resistant materials, the Cellerciser comes with or without a stabilizer bar. It also folds in half for easy portability. If weight machines are not your thing, then use this rebounder as a healthy alternative to weight training equipment. Many prime time television shows such as the Doctors, the Biggest Loser, and the Today Show consider the ReboundAIR one of the best rebounders around. This foldable rebounder features high quality soft-bounce springs, safe and durable hinges, a virtually indestructible frame, and fitted legs that unlock for easy storage. It also features a Permatron mat, which guarantees to withstand 300lbs of user weight and last decades of regular use. Is the Cardio Wave Machine Good for Weight Loss?